Alice Ivers was born on February 17, 1851 in Sudbury, England, or so she claimed. 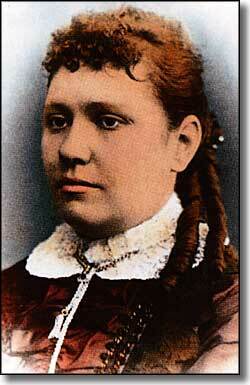 In reality, there are other reputable sources that say she was born in 1853 in Virginia to Irish immigrants. Either way, it wasn't a very auspicious beginning, but late in her teens, her family took her to Colorado where Alice met and married a mining engineer named Frank Duffield. Frank liked playing cards and, in the beginning, Alice would just stand behind him and watch. After a while, she started sitting in on games while Frank was working and she quickly demonstrated a certain affinity for poker. 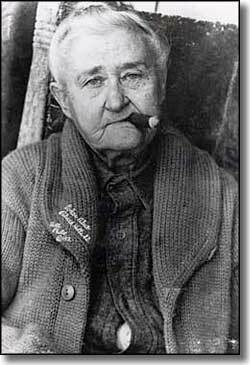 After Frank was killed while resetting an unexploded dynamite charge in a mine at Leadville, Alice turned to the poker tables for a living. Soon the miners and other gamblers were calling her Poker Alice. She had a good head for counting cards, figuring odds and distracting male players with her looks: most pictures of Alice show a rough woman in her 70's with a cigar in her mouth but even into her 50's she was an attractive woman who wore only the finest clothes (poker and faro paid good and she could afford what she wanted). Alice moved from boom town to boom town, saloon game to parlor game, just like any other professional gambler. In Colorado she worked gambling rooms in Alamosa, Georgetown, Trinidad, Central City and Leadville before heading south to Silver City, New Mexico. One night in Silver City she hit it big at a faro table and "broke the bank," or so she said. Some folks figure she just saved up her winnings, but either way, when she had enough cash in hand, she went to New York City to have some fun. She didn't stay long in the East and when she returned to the west, she went to Creede and did well at the tables again. "I would rather play poker with five or six experts than to eat," was one of her favorite comments on life. Fair-haired, blue-eyed, Alice liked her fashions. She also liked her small black stogies. And because of her religious upbringing, she never played (worked) on Sunday. Like most professional card players, Alice was locked and loaded, usually carrying a .38 within easy reach. After leaving Creede around 1890, she travelled to Deadwood, South Dakota and took a job dealing in the saloon of one Bedrock Tom. At the next table the dealer was W. G. Tubbs. One night a drunken miner pulled a knife on Tubbs and Alice palmed her .38 and put a slug into the miner's arm. This action marked the beginning of the romance between Tubbs and Alice. Shortly after that, Alice Ivers Duffield married Warren G. Tubbs. Tubbs might have been a good housepainter but he wasn't good at cards: Alice always said "he wasn't lucky," but then, next to her, who was? So she tried to keep him painting while she'd go to town and play cards, sometimes making as much as $6,000 in a good night. Together they had 4 sons and 3 daughters. In the interests of keeping the children out of the gambling halls, she and Tubbs moved the family out of Deadwood and onto a homestead northeast of Sturgis on the Moreau River. Somewhere along the line Tubbs had contracted tuberculosis while painting houses and Alice was also trying to nurse him back to health. She later said she really liked the peace and quiet out there on the Moreau River and never missed the saloons and gambling halls. In 1910, during a blizzard, Tubbs contracted pneumonia and died in Alice's arms. She then drove his frozen corpse in a horse-drawn sled to Sturgis, 48 miles away, and pawned her wedding ring to pay for his funeral. After that, she went straight into the saloon, sat at the poker table and won enough money to get her ring back. While she was gambling in Sturgis, George Huckert was hired to watch her sheep on the homestead. He kept proposing to her and finally, when his back wages totalled $1,008, she remarked "It would be cheaper to marry him than pay him off," so she did. The marriage was short: Huckert died in 1913. That made Alice a widow for the third time. "I went to the bank for a $2,000 loan to build on an addition and go to Kansas City to recruit some fresh girls. When I told the banker I'd repay the loan in two years, he scratched his head for a minute then let me have the money. In less than a year I was back in his office paying off the loan. He asked how I was able to come up with the money so fast. I took a couple chaws on the end of my cigar and told him, `Well, it's this way. I knew the Grand Army of the Republic was having an encampment here in Sturgis. And I knew that the state Elks convention would be here, too. But I plumb forgot about all those Methodist preachers coming to town for a conference'." This was probably the most famous story ever attributed to Poker Alice and, if true, says a lot about the times. In 1913 there were a bunch of soldiers in the house getting pretty unruly and she fired off one rifle shot to quiet them down. Unfortunately, the bullet passed through two of the soldiers, killing one of them. The police closed down the house and took Alice and all six of her girls to jail. At her trial, the shooting was ruled accidental and she was acquitted but forever after, the authorities at Fort Meade were on her case. She was in her 60's by then but they kept arresting her for drunkenness and keeping a bawdy house. She always paid her fines and went back to business as usual but eventually, she was sentenced to a term in the state pen for her repeated convictions as a madam. Being 75 years old at the time of her sentencing, she was almost immediately pardoned by the governor. Alice was a professional gambler, never a "soiled dove": gamblers enjoyed a much higher social status and pay scale. For the last 20 years of her life, in addition to running the house in Sturgis, she was an often-seen, well-known card player in Deadwood, a town which tolerated gambling and prostitution up until 1987. Alice died on February 27, 1930 after a gall bladder operation in a hospital in Rapid City. She was buried in Sturgis at the St. Aloysius Cemetery. Her house was vacant for a long time and scheduled to be demolished when a Sturgis businessman bought it and had it moved to Junction Avenue in Sturgis where it now serves as a Bed & Breakfast Inn. The drawing of Alice Ivers is in the public domain. The black-and-white photo is courtesy of the South Dakota Historical Society.